It seems like everywhere I turned this year, if I didn’t hear Pharrell Williams’s “Happy” playing every ten minutes on the radio or in a new lip dub on YouTube, I was watching my friends post pictures of lattes and sunsets and guacamole with the hashtag #100happydays. Maybe it was because this was a challenging year personally, as I watched many people close to me deal with real, life-changing struggles. Or maybe it was because I turned 27 and suddenly felt an immediate, boulder-heavy pressure to know exactly where my life was headed and how and when I was going to get there. But never before have I felt such a push to be unabashedly, unquestionably, unapologetically happy. Most people who know me would tell you I’m an optimistic, outgoing person. I like to make the people around me smile, and keep in touch with the people I love who are a thousand miles away. On the outside, feeling happy does not seem like it’s a problem for me. And it’s not. Where the pressure comes in is when you start looking for Happiness with a capital H. Happiness becomes another item on your Life Checklist. Beyond the obvious fact that if you wait to achieve all of your life goals before you allow yourself to be Happy, you could be waiting years, if not decades… the scary thought remains that even if you get to the bottom of that checklist you still might not be Happy. And in the meantime, you may have cheated yourself out of all the beautiful, little-H happy moments along the way. 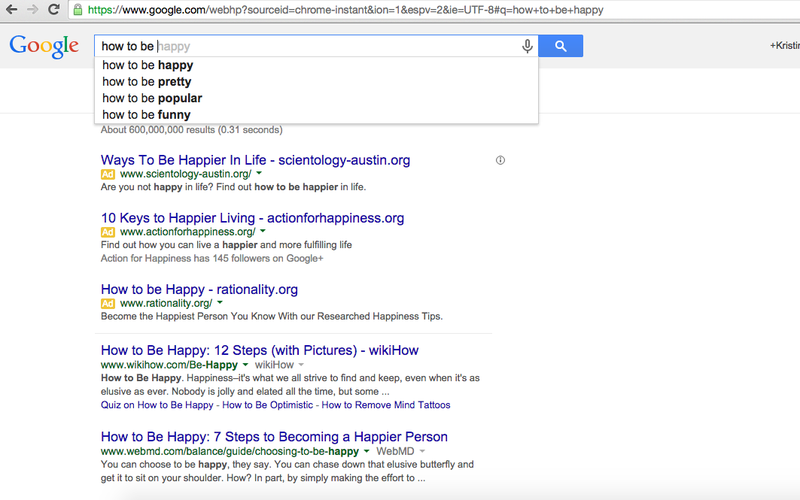 The number one thing Googlers want to be? Happy. I even bought a book about happiness this year. I don’t remember what it was called, but it literally had a picture of a fence on the front cover showing the grass greener on the other side. What I learned? Happiness is not sustainable. (That may have been a word-for-word sentence in the book.) We become accustomed to the joy we feel from a new job, a new relationship, a new life change. We forget how happy those things make us. The book said a Nobel prize winner was asked how long the excitement lasted from his win; I believe his response was that it lasted about a day. This isn’t meant to be a pessimistic viewpoint; in fact, I hope it makes you breathe a sigh of relief. You are not alone. There is not a person on this planet who feels happy 100 percent of the time. And guess what? That is okay. Striving for a Happy Life is not only normal, it’s admirable. But when you’re tunnel-visioned on Happy, you may find you’re not treating yourself with the kindness you need when you’re not quite there. When you’re struggling with doubt, or anger, or grief, or frustration, the negativity in those emotions is magnified when you face them with an attitude of “I should be Happy.” Feeling those things doesn’t make you Not Happy–it makes you Human. **I should add, I have no ill will toward the 100 Happy Days project. I was reading up on the guy who started it, and I love the idea of finding things in our lives that we are grateful for. (Remember what I said before about the happiness book and how happiness isn’t sustainable? Cultivating gratitude was a suggested solution for that.) But I guess #100GratefulDays doesn’t have quite the same ring to it. And I will reluctantly admit that, even after the overplayed summer that it had, there are still times when Pharrell’s song comes on, and I clap along.